On the 6th (Sat), you'll have a packed day of sightseeing: pause for some serene contemplation at Basilica di Sant’Antonio, take in the spiritual surroundings of Scrovegni Chapel, snap pictures at Ponte dei Sospiri, then take in the architecture and atmosphere at Basilica di Santa Maria della Salute, and finally head off the coast to Isola di Burano. To see ratings, where to stay, maps, and more tourist information, use the Venice online journey planner . Cairo, Egypt to Venice is an approximately 9-hour flight. You can also do a combination of flight, bus, and train; or drive. Due to the time zone difference, you'll gain 1 hour traveling from Cairo to Venice. Traveling from Cairo in April, things will get slightly colder in Venice: highs are around 21°C and lows about 11°C. 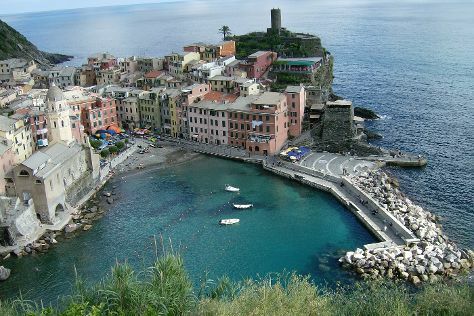 Finish your sightseeing early on the 7th (Sun) to allow enough time to drive to Cinque Terre. Start off your visit on the 8th (Mon): explore the striking landscape of Sentiero 586 (ex n.6D) Volastra-Case Pianca, then get to know the fascinating history of Borgo Storico di Corniglia, and then trek along Footpath Monterosso - Vernazza. To see reviews, traveler tips, photos, and other tourist information, go to the Cinque Terre online trip itinerary builder . You can drive from Venice to Cinque Terre in 4.5 hours. Alternatively, you can take a train; or take a bus. In April in Cinque Terre, expect temperatures between 22°C during the day and 9°C at night. Wrap up your sightseeing on the 8th (Mon) to allow time to drive to Orvieto. The striking town of Orvieto, perched on a volcanic cliff overlooking the Umbrian countryside, is known as the Green Heart of Italy. 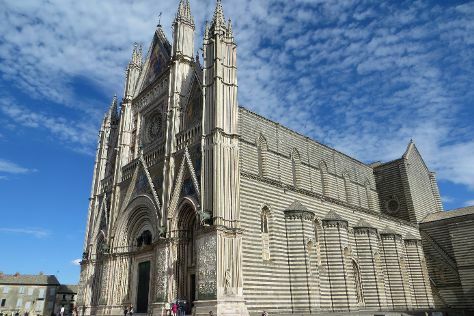 On the 9th (Tue), contemplate in the serene atmosphere at Chiesa San Giovenale, do a tasting at Madonna del Latte, then contemplate the long history of Pozzo di San Patrizio, then get to know the fascinating history of Centro Storico Orvieto, and finally steep yourself in history at Duomo di Orvieto. To see maps, ratings, and tourist information, use the Orvieto online travel planner . You can drive from Cinque Terre to Orvieto in 4 hours. Alternatively, you can take a train; or do a combination of train and flight. In April, daily temperatures in Orvieto can reach 21°C, while at night they dip to 9°C. Cap off your sightseeing on the 9th (Tue) early enough to go by car to Spoleto. Spoleto is an ancient city in the Italian province of Perugia in east central Umbria on a foothill of the Apennines. Start off your visit on the 10th (Wed): take a stroll through Il Borgo di Monteleone di Spoleto, get to know the fascinating history of Albaneto, and then take in the dramatic scenery at Cascata delle Marmore. 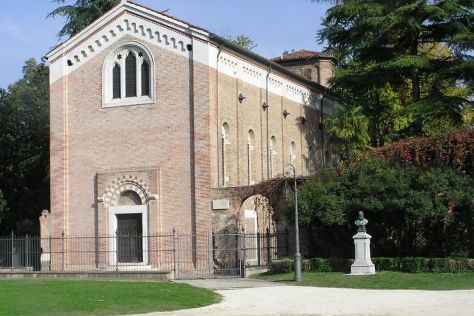 Get ready for a full day of sightseeing on the next day: examine the collection at Museo della Porziuncola, contemplate in the serene atmosphere at Eremo delle Carceri, then take in the spiritual surroundings of Basilica di Santa Chiara, and finally contemplate in the serene atmosphere at Basilica di Santa Maria degli Angeli. To see traveler tips, reviews, photos, and more tourist information, go to the Spoleto trip planning app . Traveling by car from Orvieto to Spoleto takes 1.5 hours. Alternatively, you can take a train; or take a bus. In April, daily temperatures in Spoleto can reach 21°C, while at night they dip to 9°C. Wrap up your sightseeing on the 11th (Thu) early enough to take a train to Rome. 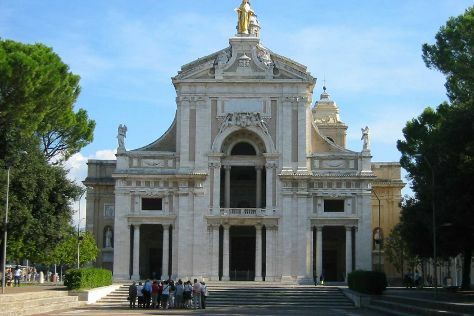 On the 12th (Fri), pause for some serene contemplation at San Pietro in Vincoli, delve into the distant past at Parco Archeologico di Ostia Antica, then get to know the fascinating history of Centro Storico Associazione Centro Storico, and finally pause for some serene contemplation at Church of St. Louis of the French. Get ready for a full day of sightseeing on the next day: pause for some serene contemplation at Santa Maria in Trastevere and then get to know the fascinating history of Vatican City. To find more things to do, photos, and other tourist information, go to the Rome route builder . Getting from Spoleto to Rome by train takes about 1.5 hours. Other options: drive; or take a bus. In April, daily temperatures in Rome can reach 24°C, while at night they dip to 11°C. Wrap up your sightseeing on the 13th (Sat) to allow time to travel back home.